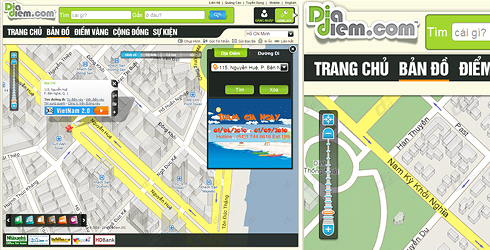 Dia Diem JSC is Vietnam’s first online map publisher. Its free Web mapping service, Diadiem, offers searchable maps, directions, satellite photographs, a user community with geotags and more. The site utilizes a propriety direction-finding engine and features a comprehensive online directory service. Dia Diem also offers Mobile Diadiem for phones and wireless devices and a robust and customizable API (Application Programming Interface) for online businesses to easily integrate maps onto their websites. Their mobile app is available as a free iPhone download and is pre-installed on leading local handset models.